Never Give Up: The Holy Family: What About the Relatives? The Holy Family: What About the Relatives? Last Sunday, the Gospel reading spoke of Jesus's first visit to Nazareth after he had begun his public ministry. Everyone had heard the reports of his mighty deeds, and yet, when he stood up in his hometown synagogue, the locals seemed to find it all a bit too much to take. They couldn't understand why their Jesus, whom they'd known as far back as they could remember and had seen day after day, was all of a sudden a big shot. "'Is he not the carpenter, the son of Mary, and the brother of James and Joses and Judas and Simon? And are not his sisters here with us?' And they took offense at him. Jesus said to them, 'A prophet is not without honor except in his native place and among his own kin and in his own house'" (Mark 6:3-4). Eventually, some of these people followed him. They saw by faith that his ministry was rooted in the extraordinary way that he had lived normal life all those years in their midst. They saw this reflected also in his mother Mary, and in Joseph (whom they remembered). Those who overcame the temptation to "take offense" -- who refused to be closed up in their jealousies, their narrowness, or in the cynicism that thinks it has nothing new to learn -- would have wanted to follow him beyond Nazareth, to share in his work of building a greater house. This passage is significant in so many ways, but I just want to reflect upon the context it reveals. All those years of the "hidden life" at Nazareth were probably a lot more crowded, busy, and noisy than we generally imagine. It is beautiful to meditate on how the Holy Family encouraged and sustained one another in a profound and vital holiness that also passed through years of uneventful time and ordinary, daily responsibilities. It is also worthwhile, however, to consider what "normal life" actually meant in Nazareth in Palestine, two thousand years ago. We tend to imagine the Holy Family living in a home pretty much like ours (just like Murillo, above, puts them into an unostentatious but comfortable and spacious 17th century environment). And we often envision them as alone, even perhaps a bit isolated (or at least appearing as such). But I wonder... perhaps the greatest daily challenge for the Holy Family may have been the not-so-holy extended family and neighbors that they probably ate, drank, worked with, and even slept under the same roof with during all this time. Was not the home in Nazareth and its immediate environment a living space -- awkwardly divided -- and occupied by, basically, everybody? Jesus, Mary, and Joseph... and who else? 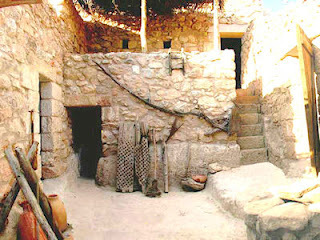 Typical Palestinian first century dwellings looked like this. Mary's parents, while they were still alive, were close at hand. (It's not like Joachim and Anna would have retired and moved to Florida.) Then there were aunts and uncles and all those cousins who get translated as "adelphi" ("brothers") in the Greek New Testament. Mary and Joseph lived with Jesus and his "kin" -- the whole big, affectionate, bickering, sometimes nosy extended family such as can still be found today in the cultures of the Levant. The "neighbors" (how did they arrange living space, I wonder?) were probably relatives too. 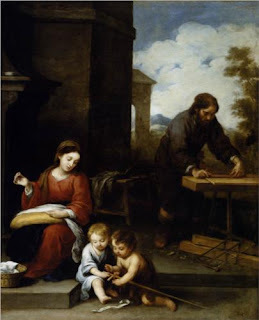 We could try to imagine what work and cooking and all that was like, but what strikes me most is that the Holy Family was surrounded by people whom they were called to love every day. This is an image that challenges me: Mary and Joseph were contemplatives in the midst of the world. The "hidden life" of Nazareth was in their hearts, as they lived cheek-to-jaw with "the brothers of Jesus" and all the rest of the family and the people who "knew them," living with a mystery that they could not communicate except through love. We, too, are called to live with Jesus in the midst of so many of our human brothers and sisters who need to come to know Him, to be touched by Him through gestures of love that embrace the familiarity of each day with patience, kindness, simplicity, ardor, and courage. May the Lord enable us, like the Holy Family, to live as companions of those around us, offering compassion, not fleeing from the ordinary circumstances of life but cherishing them, and building with them a house big enough for all the world. Saint James the Apostle: A Model For Today?